Above shows my draining setup. The black stick is a chopstick and is used to allow air circulation into the jar. Here’s how it works. 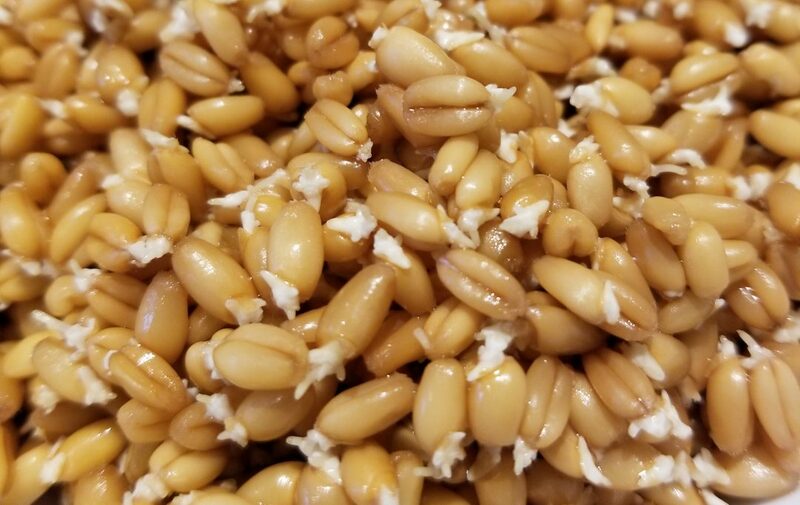 Soak the wheat berries for 12 hours. Drain and keep moist until the seeds germinate. Dehydrate the wet seeds. Grind into flour. Bake bread. Simple. I’ve never used sprouted wheat but I’ve learned it may well be the next revolution in bread. The main difference is in the taste, I’m told. It also unlocks more nutrition by making the good stuff more bio-available. It is more digestible, especially for those having a sensitivity to gluten. Sugars are reduced during germination so the protein is increased. Some health claims are debatable, but even so, the taste advantage seems to me worth a try. I started my experiment last evening at 8pm. I put 400 grams (about 2 cups) hard red winter wheat into a 2 quart canning jar. I rinsed it well and dumped the water. I then filled the jar with dechlorinated water. This morning at 8am I emptied the water, fastened a screened lid on the jar and positioned in a bowl so the excess water would drain well. Every two hours or so I filled the jar and sloshed it around to rinse the seeds well and dumped the water. At about 11am I noticed a tiny white plant starting to emerge from the ends of the seeds. At 6 pm I judged the germination to be progressed enough to stop. I rinsed well and spread the wet seeds into my handy dandy Nesco dehydrator. I had cut and installed screen cloth into each of the six trays. I set the temp dial to 105 F. and started the dehydrator. I weighed the beginning quantity because I want to be sure to get the seeds at least as dry as they started because I don’t want to clog the stones in my mill. After 24 hours of drying I will gather the seeds from the trays and weigh them to see how close they are to the original 400 grams. Since the batch is so small at 400 grams, I immediately started another batch so I can build up enough flour to try several recipes. On the left you see my dehydrator trays, with germinated seeds. On the right is a close-up of the germinated seeds.